The 98 meter long, 5279 dwt freighter Changda 216 sank near the entrance of the Cagayan River, Luzon, Philippines. The freighter was partially loaded with a cargo of magnetized sand heading to load additional cargo when it was struck by heavy waves. 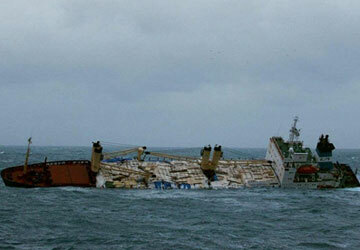 The waves caused the cargo to shift and the vessel lost stability. Reports state 13 crew of the 15 on board were rescued. The other 2 crewmen were reported lost. Some pollution was released from the Changda’s 70 tons of diesel fuel on board. No salvage attempts have been made and reports state the mast is the only portion still above water.